CRC012 IS SUPREME COURT RULING A PLUS FOR RETAIL REAL ESTATE INVESTORS? Online retail faces a new hurdle after the Supreme Court of the United States (SCOTUS) strikes down the 1992 ruling of the Quill Corp. v. North Dakota case. In June 2018, SCOTUS handed down its 5-4 ruling in a case from the other Dakota, South Dakota v. Wayfair, with Justice Kennedy authoring the majority opinion. 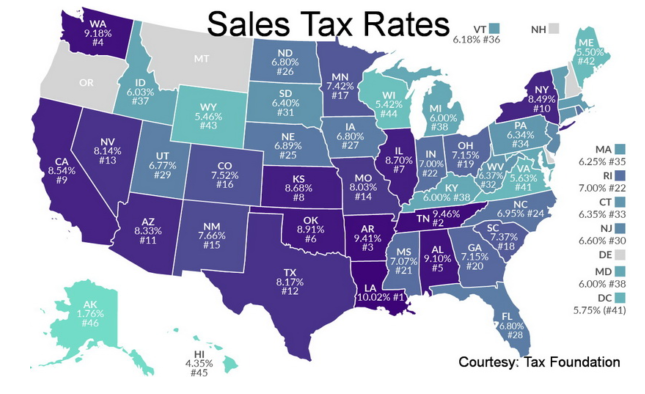 South Dakota’s new law requires the collection of taxes if sales into their state exceed $100,000 or the seller has more than 200 separate transactions per year. Even if sales do not reach either of those two thresholds, online retailers will have to track their sales and set aside enough money to pay the sales in South Dakota. Forty-five states and the District of Columbia collect statewide sales taxes plus many local governments collect additional tax. For example, in Berwyn, Illinois the combined 10% sales tax rate is the result of the Illinois state tax rate of 6.25%, the Regional Transportation Authority (RTA) tax of 1.00 %, Cook County tax of 1.75%, the City of Berwyn tax rate of 1%. Multiply that across the United States and you get over ten thousand jurisdictions to track of for sales. This ruling will tilt the playing field towards large scale physical retailers who already are set up to handle the record keeping such as Walmart, Kroger and Amazon. It will make it harder for the online retailers who try to compete on price alone by subsidizing delivery charges and slashing already razor thin margins. Online retailers will have the additional expense of paying for software solutions to solve the record keeping and tax payment problem. Online retail expenses have recently been battered with additional costs like rising Google ad rates and Search Engine Optimization (SEO) services searches to foster customer acquisition. Also Facebook, which had been one of the best platforms for customer acquisition, has declined in user engagement by 67% according to the 2018 Infinite Dial Report yet they have more than doubled the ad rates since early 2017. It may be a long time before E-commerce will be as profitable as Brick-and-Mortar stores. Even Amazon, the kingpin of all e-commerce has seen the cost that sales tax and expensive ad campaigns incur. Amazon’s response? To spend $13.7 billion to acquire a brick and mortar presence with Whole Foods. Amazon is going even further by opening its own brand of brick and mortar retail stores. Amazon Go’s primary feature will be the lack of a physical checkout line. Perhaps consumers will appreciate the ability to see and touch the products they plan to buy and it will cut down on returns. Reducing returns is a win for any online retailer according to Happy Returns Inc., a company that handles returns for retailers. They estimate that the rate of return for online purchases is close to four times higher than the rate for physical-store sales. But there is one advantage online retailers maintain: convenience. You go on a website, click a few times and the product arrives at your home. If you pay for Amazon Prime, you get free delivery “guaranteed” within a specific window. But you may also have noticed that the cost of Amazon Prime has been steadily increasing. That fast delivery is expensive and reduces profit margins so that online retailers may be forced to raise price points. In 2017, the Council of Supply Chain Management Professionals reported that the costs of logistic and shipping rose to $1.5 trillion. With the recent SCOTUS ruling we will probably see more multi-channel retailing strategies with online retailers and fulfillment operators teaming up with physical stores. The strategy will be to morph into “Bricks & Clicks”. In fact, new research from IHL Group, details how North American retailers will open 12,663 stores and close 8,828 stores in 2018, for a net increase of 3,835 store locations. The immediate future for retailers will be their heads in the Cloud with feet also firmly on the Ground.